Today I went browsing our pictures and videos from the 2013 “Drawing the big Cats” trip, and was reminded of the amazing luck we had to meet two different leopard mothers with their offspring, which taught us so much about the family life of the most secretive of the African big cats. Unlike the case of lionesses, which can share their motherly duties with other members of the pride, the females of the other big cat species have to deal with the unstoppable playfulness of their cubs without any assistance. As a result, there are many situations where the mother’s body language shows the whole range of emotions between enjoyment and impatience in a matter of seconds. 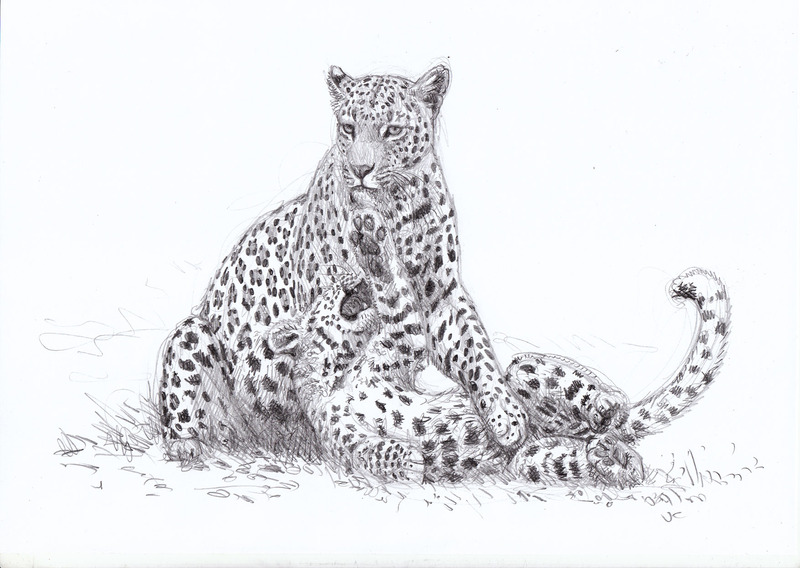 I decided to make a quick sketch to capture such a moment, when our Chobe mother leopard was trying to bring her cub to a stashed prey for breakfast. But the cub only wanted to play, and play more! Today we leave for Botswana, where we will meet a fresh group of enthusiastic artists, plus the fabulous team at Elephant Trails Safaris, and hopefully…the big cats! Looking at our pictures from last year’s trip, like this alert leopard from Chobe Natonal Park, we think we can´t beat those encounters…but, who knows? We will be chronicling on this second edition of “Drawing the Big Cats” upon our return, so stay tuned! Our next “Drawing the Big Cats ” safari will be in august 2014. Get ready! And here is a picture of one of the powerful male lions that came to meet us in Savuti, as captured by my son’s camera. Life at its most energetic! If you want to join the safari “Drawing the Big Cats with Mauricio Anton”, it is about time to get in touch with my friends at Elephant trails! This is going to be the experience of a lifetime. We get to Botswana at the best time of the year to observe the big game animals, including the felines, against the background of what is probably the most sublime savannah landscape in Africa. We visit the Okavango Delta, the legendary Savuti Marsh, and the spectacular Chobe River front, ending with a visit to Victoria Falls and a close-up and personal experience with lions. After and in between our game-drives, we will share sketching sessions back at camp, and exciting discussions about big cat action and anatomy. Besides, there is an exclusive surprise for all the participants, but that will be revealed in due course! The safari departs on September 12 and ends on September 22. Don’t miss the opportunity to join the creative event of the year! You can contact Mauricio Anton (info@mauricioanton.com) or Elephant trails for information about prices and details. Join our “Drawing the Big Cats” safari! DRAWING THE BIG CATS SAFARI: ITINERARY. This is an overland safari where we spend all our time in the remote wilderness of Botswana. During the game drives we will concentrate on watching the wildlife, and making photographs or videos is the priority especially during our encounters with the big cats which are usally brief and always unpredictable. However, on particular occasions we will be able to use our sketchbook and pencil for some live sketching. It will be during the lunch stop or back at camp that we will have our drawing classes and learn about the structure, shape and action of the felines and how to materialise it in our sketches. On some evenings we will also have presentations about big cat evolution, behaviour and adaptations, all of which will enrich our experience of the real animals in the wild. Arrive in Maun, the safari capital of Botswana, and overnight in the Sedia Hotel on a dinner, bed and breakfast basis. We take a scenic flight over the Oklavango Delta for a breathtaking vew of some of the wilderness that we will be visiting over the following days. For bird enthusiasts there is a chance to watch some of the most colourful local bird species up close at the hotel’s garden bird feeders. We depart Maun and travel the 5-6 hour journey into the Moremi Game Reserve which is situated in the Okavango Delta. Here we will camp in a private campsite in the heart of the waterways of the Okavango Delta. Day 2 takes us on a boat ride on the main channels and lagoon systems of the northern reaches of the Okavango Delta. There is a great variety of birdlife along these channels, and mammals such as the elusive otter and majestic lechwe may be seen. If we are lucky we may even see an elephant cooling off in the clear waters or catch a glimpse of the shy sitatunga. After enjoying our early morning breakfast and clearing our tents we start our journey to the Eastern most extremity of the Okavango Delta. The Khwai area is rich in habitat and wildlife. The animals are attracted to the narrow ribbon of water that is the Khwai River and this provides for some spectacular wildlife viewing. This is an area where lion and leopard may be seen. There is a healthy population of plains game, including kudu, impala, giraffe and zebra. Today we have a 6 – 7 hour journey to Savuti- we will be travelling through wilderness area for the whole journey. This is a day that puts into perspective the sheer size of this wilderness area. Savuti lies in an ancient lake bed that is punctuated with small rocky hills (kopjes), some of which hold ancient San rock paintings. Here we explore the Savuti marsh and river bed for the abundant wildlife of this timeless place, including its famous elephant and lion population. Wild dog are regularly seen as well as a large variety of other mammals. Savuti is a favoured area of wildlife- photographers as well as film-makers and many well known wildlife documentaries have been filmed here. Today’s journey takes us out of the ancient lake bed and Kalahari basin , through the teak forests that make up the north eastern part of Botswana. For a long part of the journey we will follow in the footsteps of famous missionary and explorer Dr David Livingstone. We pass through some villages that are recorded by him in his books about his travels. The Chobe river floodplain is undoubtedly one of the greatest wildlife areas on the continent and one is sometimes overwhelmed by the sheer numbers of animals. Here we divide our time between game drives along the river and in the forest and a boat cruise on the Chobe River which is one of the highlights of the trip. We will also have some time to do some curio shopping in the village of Kasane. Today we leave our camp for the last time as we are transferred to Victoria Falls. Here we will overnight in a comfortable hotel. We will have time to spend a few hours at the world famous “Smoke that Thunders” or in the local Batonka language “Mosi Oa Tunya”. (The entry fee is the responsibility of guest) It is one of the 7 natural wonders of the world . Looking back at four years of our “Drawing the Big Cats” safari I am amazed at how much I have learned first-hand about the cats and their adaptations to their wild home -and I thought I knew something! That experience becomes a key ingredient to enrich my renderings of the felines, and my reconstructions of their fossil relatives and their lost world, not to mention the challenge to try and reflect those complexities with my limited abilities… But beyond those “practical” applications, I also get the impression that my life has grown in several dimensions: length, width, depth, height… and I suspect I am not alone in feeling that way! Length, because each minute in the wilderness of Botswana seems to last so much more than it would do on an average day back at home. Our life lengthens each time we go there! Width, because the endless horizons of the African savanna seem to create new room within the soul, to make our mind more spacious and free to roam wherever it will. Depth, because the myriad sensations, both striking and subtle, that surround us while on safari, (especially when camping out in the bush), renew our senses and give us an intuition of a world where boredom is impossible and whose deep complexity we could not begin to comprehend in a lifetime. And height, because there we are given a privilege of a true spiritual kind. Flying over the Okavango delta we know we are witnessing a miracle, not only because this giant oasis in the Kalahari sands is such an improbable phenomenon, but also because its preservation is a monument to the faith of many women and men who have fought hard to preserve this jewel for all of us. I get a renewed sense of awe both at wildlife and at that particular breed of people who can recognize what gives our life dignity, what makes us truly human, and are ready to devote themselves to protect it in a brave and selfless way. After each trip we come back home with a treasure of memories, pictures, sketches… but perhaps the most important thing is less easy to define: we could call it a transformation. While out in the wild, we are reminded of (and submerged in) the things that matter in life: nature, art, good company. And we become more able to free ourselves from the many petty traps that ensnare us in everyday life. If I picture myself back in Savuti, looking up at the star-filled sky after the campfire is no more than cooling embers, then, strangely enough, everyday problems appear more manageable. Have you felt the same way? Well, no magic tricks here, just pure life force of a kind we can only get in the place that made us human: the African savanna, the Cradle of Human Kind. I cannot wait to go back! Out in the wild, the big cats spend most of their time just resting, and it is only on rare occasions that one gets a glimpse of their full potential for explosive action. And yet it is those brief moments that their whole structure is designed for. 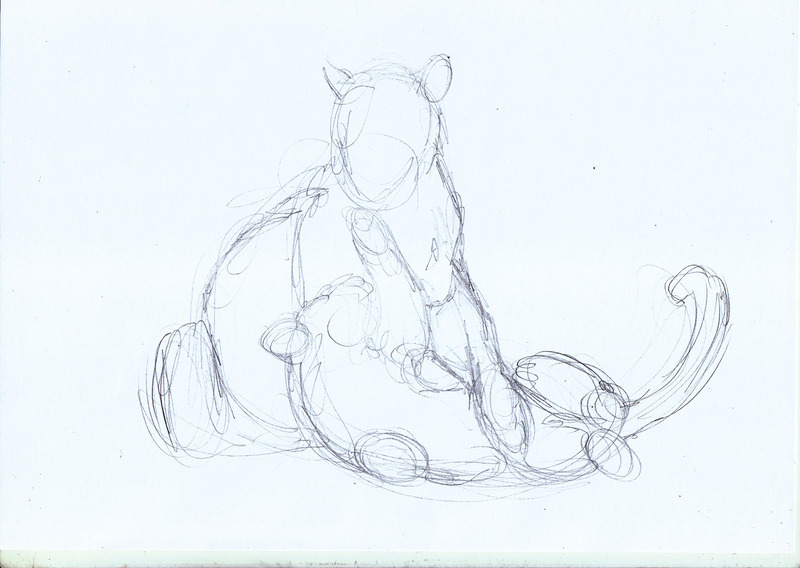 When I sit at my drawing table conceiving an action scene, as in the case of my illustration of two fighting Barbourofelis, I try to get all the details of the action right, and I use my memory and all the reference material available to represent the conflict taking place. 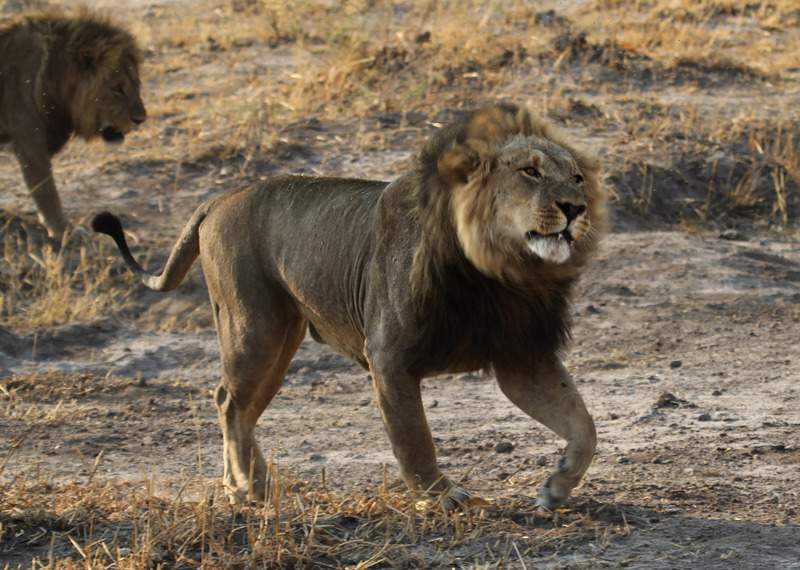 But last summer in Botswana we had a totally unexpected opportunity to see what a big cat fight really looks like. I referred to that episode in a previous post, but there is so much more about those amazing moments. One amazing aspect which unfortunately you cannot show in a painting is sound: the animals are impressively loud, and you don’t just hear the sound, it really gets to your guts. Another important factor is speed (it all happened in less than 5 seconds) but that is also impossible to show in a static image, even if it can be implied. There is a lot of other elements that can indeed be represented through drawing and painting, and they take a good deal of study to comprehend. It is a good thing that we can bring back our pictures and videos in order to elaborate an experience that struck us like lightning and will stay with us while we live. One second the lioness seems to be sound asleep as the male delicately approaches her. The next second she is an exploding whirlwind of teeth and claws, and the thunder of her roar drowns any other sound from the surroundings, or from us. We witnessed this burst of female fury in Northern Botswana during the last edition of our “Drawing the Big Cats” safari, and certainly none of us would like to have been in the place of the scolded young male lion. No real harm was done, but the lioness made a very clear statement. How to capture the raw feline power of that scene with a simple pencil sketch? I try with a view of the angry face as the lioness snarls at the rearing-up male. In this early stage I try to capture the general proportions of the cat’s head and the shape of the mouth opening with a few simple lines. It is crucial to get these lines right because I will be spending quite a few minutes with the details of the teeth and palate, and it is sooo frustrating to find out that the mouth was too narrow or the mandible was twisted after you had already wrought the details! After some more minutes I have given shape to the main structures of the head and mouth, although It seems I will need to go against my own sketching rules and use the eraser after all: the tip of the nose looks to be projecting a bit too far forward! Some more minutes into the work, and now I am ellaborating on the grayscale. Evolution has provided cats with a fantastic “natural makeup” to boost their emotional expressivity, and their faces are a study in tone contrast. Black lipstick, gothic style, stands in striking contrast against the pale fur of the muzzle, and one needs to be careful in order to show the difference between the dark tones of the lips and the darkness of the oral cavity. In this provisionally finished stage I have insisted with the dark grey tones of the shadowy background. I remember the charging lioness as a fast moving tawny shape against the dark shade of a thick bush, with the fearsome canines flashing out. To capture this impression I need to spend some more minutes adding pencil strokes until I get a sort of dark mass from which the facial features stand out. I never tire of quoting pioneer paleoartist Charles Knight when he said that you cannot pretend to be able to reconstruct an extinct animal unless you can properly depict its living relatives. As I further my work on the collection of extinct cat illustrations for my upcoming book project, I find it so useful to sketch time and again the big cats we have encountered in the wild. It is an exercise that never fails to enrich my perception of the animals and to deepen my admiration for them. 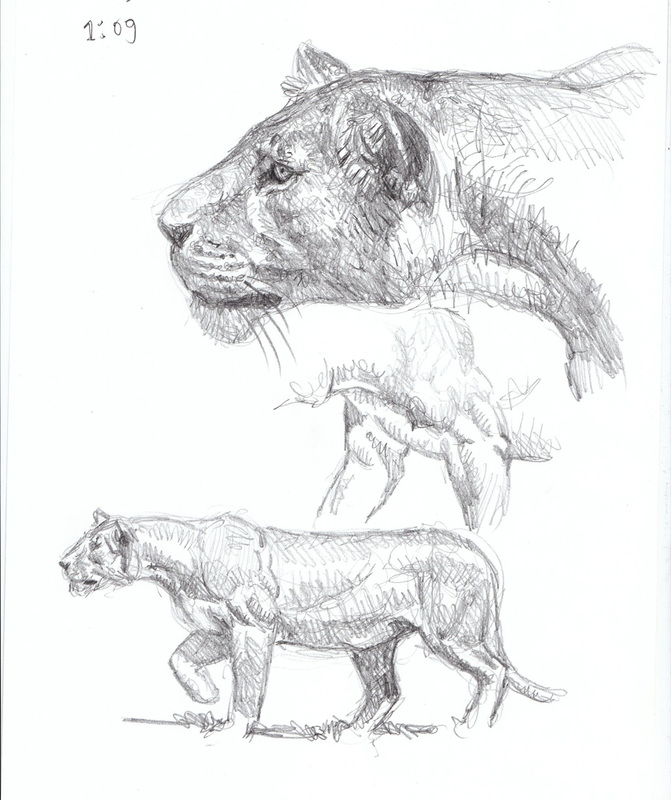 Drawing is most fun when it implies learning, and sketching the wild cats of Africa teaches me something new everyday! El próximo 18 de Marzo, impartiré la charla titulada “Los grandes felinos de África: evolución, pasado y presente”. Desde mi primera visita a Botswana en 1993, mis viajes a África en busca de los grandes felinos han supuesto un contrapunto y un complemento a mi trabajo de investigación sobre la anatomía, evolución y adaptaciones de estos animales. Pero a lo largo de estos años también he tenido ocasión de estudiar en diversos museos los restos fósiles de los félidos extintos de ese continente. En esta charla hago un rápido repaso a la historia evolutiva de los félidos en África, mostrando algunas de las especies más sombrosas que allí han habitado, así como unos breves apuntes de mis observaciones más sorprendentes de los leones, leopardos y guepardos en su ambiente. Finalmente proyectaremos en primicia mi documental “Belleza Salvaje: la visión de un artista de los grandes felinos africanos”. La conferencia será en el marco del Gabinete de Historia Natural, un espacio de encuentro para todos los aspectos de la naturaleza en el centro de Madrid. Lugar: Calle Victoria, 9. Madrid. Entrada: 5 Euros hasta completar aforo.